Yancy Derringer Episode 23 – When Mississippi riverboats sink in record numbers, Yancy investigates whether aggressive Gilded Age monopolizer Emerson lurks behind the crime waves. The Southern Belle, owned by a fiery redhead, is the latest victim, but she opposes rival paddle-wheel master Yancy’s tactics, which center on someone marking false twain to cause shipwrecks. Yancy Derringer is a gentleman adventurer. He is a former Confederate Army captain who has returned to New Orleans, Louisiana in 1868, three years after the end of the Civil War. Widely respected by all parts of New Orleans society, he is recruited by the Federal city administrator, John Colton, to work as a secret agent at no pay, and only Colton knows of his special role. Often at the beginning of an episode, Colton, a former Union Army colonel, asks Yancy to help solve New Orleans’ present threat and, often at the end of the episode, he arrests Yancy for breaking the law to do it. Yancy agrees, because the United States is one nation again. Yancy owns a riverboat, the Sultana. His weapons of choice are a four-barrel Sharps Derringer gun carried in his hat, another up his left sleeve, and a knife in his belt. He is an expert marksman. He also carries a cane with a hidden sword and is said to have iron fists: one punch and his opponent remains unconscious for a day. (The belt buckle with a derringer was never one of Yancy’s props.) Yancy dresses elegantly, most often in a white suit with a long coat, ruffled white shirt, a silk vest, a sash instead of a belt, a black string tie, and a white flat-topped straw hat with curled brim. Yancy’s sidekick, Pahoo-Ka-Ta-Wah, is a silent Pawnee American Indian who communicates only by hand gestures. Pa-hoo-Ka-Ta-Wah is Pawnee for “Wolf who stands in water.” Although Pahoo is short on talk, he is long on action. Beneath a blanket wrapped about his body, he carries a sawed-off double-barreled shotgun loaded with split buckshot, which he wields in emergencies. Most of the time however, he uses a throwing knife sheathed on his back. Yancy and Pahoo live at the family plantation, Waverly. Yancy’s recurring love interest is Madame Francine (played by Frances Bergen, mother of Candice Bergen), the strong-willed, beautiful owner of a members-only gambling house in New Orleans, her real name is Nora and she’s actually Irish. Bridget Malone (played by Margaret Field, mother of Sally Field) is an Irish lass recently arrived from Ireland, originally endangered by the ship’s crew but rescued by Derringer. Miss Mandarin, Mei Ling, a former love interest and close friend of Yancy, is the proprietor of his favorite place to dine, the Sazerac Restaurant. Yancy also sometimes dines, usually al fresco, at the Charter House restaurant, whose specialty is French cuisine, and gambles at the Blackjack Club. Most of Yancy’s out-of-town associates stay at the King Louis Hotel. Yancy had a brother David who was killed in the Civil War, and his father Yancy, Sr. had also died during the war. 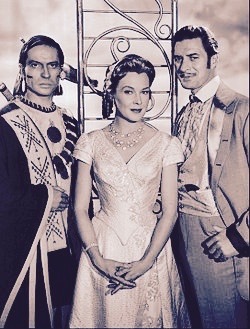 X Brands, Frances Bergen and Jock Mahoney in 1959. Yancy Derringer is an American Western series that ran on CBS from 1958 to 1959, with Jock Mahoney (1919–1989) in the title role. The show was produced by Derringer Productions and filmed in Hollywood by Desilu Productions. 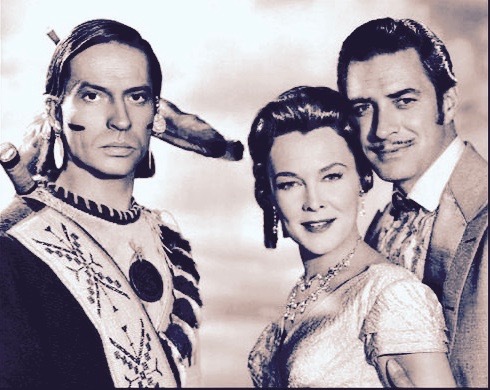 Derringer Productions consisted of half interest for Warren Lewis and Don Sharpe as executive producers, a quarter interest to Jock Mahoney for starring in the series, and a quarter interest to Richard Sale and Mary Loos, husband and wife, as creators. Desilu had just completed the 1956 series The Adventures of Jim Bowie, which was also mostly set in New Orleans. The show’s sponsor was Johnson Wax, now S. C. Johnson, and Klear floor wax was a regular sponsor. The Sales based the series on a 1938 short story written by Richard Sale. In the 1930s, Sale was one of the highest paid pulp writers. The story was never mentioned, but it was about a destitute aristocrat and troublemaker who returns to New Orleans three years after the Civil War. 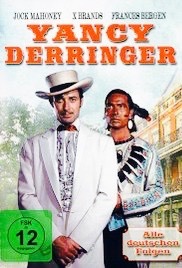 In the story, Derringer has no first name; “Yancy” was added for the TV series. The titular character, Yancy Derringer, is a gentleman adventurerand gambler. He is a former Confederate Army captain who has returned to New Orleans, Louisiana in 1868, three years after the end of the Civil War. The state is under Union control and martial law. The atmosphere is similar to Germany after World War II with a strong military presence and oversight. The atmosphere is forbidding, filled with trepidation and mourning — but life goes on. The time period is the southern Reconstruction Era. Yancy owns a riverboat, the Sultana (the actual riverboat of the same name sank from a fire/ explosion on April 27, 1865 with a great loss of life, including returning Union soldiers.) His weapons of choice are four-barrel Sharps pepperbox derringer handguns carried concealed (one held by a clamp inside the top of his hat, one in his vest’s left pocket under his jacket and one up his jacket’s left sleeve in a wrist holster), and a knife in his belt. (A belt buckle inset with a toy single-barrel derringer, sold by Mattel at the time and popularly associated with Yancy, did not resemble anything that the character actually used.) He is an expert marksman. He also carries a cane or a riding crop with hidden swords and is said to have iron fists: one punch and his opponent remains unconscious for a day. Yancy dresses elegantly, most often in a white suit with a long coat, ruffled white shirt, a silk vest, a sash instead of a belt, a black, under-the-collar bow tie), and a white, flat-topped straw hat with curled brim. Yancy’s sidekick, Pahoo-Ka-Ta-Wah, is a silent Pawnee American Indian who communicates only by hand gestures. Pa-hoo-Ka-Ta-Wah is Pawnee for “wolf who stands in water” (as mentioned in the first episode). Although Pahoo is short on talk, he is long on action. Beneath a blanket wrapped about his body, he carries a sawed-off double-barreled shotgun loaded with split buckshot, which he wields in emergencies. Most of the time, however, he uses a throwing knife sheathed on his back. Yancy and Pahoo live at the family plantation, Waverly. Yancy’s recurring love interest is Madame Francine (played by Frances Bergen, mother of Candice Bergen), the strong-willed, beautiful owner of a members-only gambling house in New Orleans. Her real name is Nora and she is actually Irish. Bridget Malone (played by Margaret Field, mother of Sally Field) is an Irish lass recently arrived from Ireland, originally endangered by the ship’s crew but rescued by Derringer. Miss Mandarin, Mei Ling, a former love interest and close friend of Yancy, is the proprietor of his favorite place to dine, the Sazerac Restaurant. Yancy also sometimes dines, usually al fresco, at the Charter House restaurant, whose specialty is French cuisine, and gambles at the Blackjack Club. Most of Yancy’s out-of-town associates stay at the King Louis Hotel. Yancy had a brother David who was killed in the Civil War, and his father Yancy, Sr., also died during the war.